The micro-mesh upper of the Nike Zoom Clear Out does not need to broken in, say a good number of buyers. They say the shoe is comfortable straight out of the box. A lot of light hoopers claim that they can feel the forefoot Zoom well. It is like the cushioning in Chris Paul’s third Nike signature shoe. The textile uppers of these Nike basketball shoes help wick away moisture, claim a good number of wearers. It works like the HOVR Havoc of Under Armour. The diamond traction pattern of the Nike Men’s Zoom Clear Out works wonders on court. According to some reviewers, they do not experience any court slippage at all. A large number of testers praise the court feel delivered by these Nike basketball shoes. Majority of buyers think that the design of the shoe is sleek. Because of the extended midsole on the sides of the Nike Zoom Clear Out, several users observe that they do not experience heel slippage. The Nike Zoom Clear Out is not recommended by testers for outdoor use. The soft and pliable rubber easily tears on rough surfaces. A handful of users observe that the forefoot Zoom is not responsive enough. A couple of wearers complain with the dead space at the toe box area of these high-top basketball sneakers. The traction, materials, and support of the Nike Men’s Zoom Clear Out have received commendations from a large number of owners and reviewers. However, they advise new buyers to test the shoe before buying to see if the cushioning setup suits them. For those who are looking for a great performance shoe on a budget, the Nike Zoom Clear Out is one of the best options on the market today. This would be a good outdoor shoe. It's cheap, number one. Ok, number two, it seems pretty durable - the outsole and even this stuff seems somewhat durable. So my main thing for outdoor shoes as I always wanted to be cheap. Not the best shoe but it will get the job done. Overall, I do like this shoe. I do not think it is a bad model at all. It's totally worth that $110. So if you're in the market looking for a new shoe and you ain't got a lot of dope, then this is the way to go. You will not be disappointed. I can promise you that. The Nike ZOOM Clear Out is another solid budget model from Nike – lightweight & supportive upper, low to the ground cushion tooling, A+ support and traction which is better than on some main models. I highly recommend you trying them out, especially if you’re looking for a solid outdoor sneaker with more than average performance with a low price tag – this is an ideal pick up for you. Best for a lighter outdoor player. So the Nike Zoom Clear is not a disappointment. It’s not a spectacular release either but I still liked playing in them. Comfortable, a basic low profile cushion setup, solid traction, good support and a nice upper. I’d actually recommend these to an outdoor player or a lower profile guard. For $100, you’re getting a pretty solid package. Released in 2016, the Zoom Clear Out is a high-top budget model from Nike. It is endorsed by Golden State Warriors forward Draymond Green. It comes with a Phylon midsole with a forefoot Zoom for responsiveness. The solid rubber outsole features a full-length diamond traction pattern for multidirectional footwork. The upper is constructed using micro-mesh for a breathable and flexible fit. Unlike other shoes, the Nike Men’s Zoom Clear Out features an asymmetrical tongue that wraps the midfoot like a burrito. Cushion. The responsiveness of the Nike Men’s Zoom Clear Out comes from the Zoom unit embedded in the forefoot area of its Phylon midsole. It absorbs impact, effectively sparing the legs and knees from stress and fatigue. This cushioning setup is designed for those who love court feel and are on their forefoot most of the time. Traction. The Nike Zoom Clear Out features a diamond traction pattern in various orientations. The design provides great stopping power. However, to maintain its grip and control on dusty courts, the grooved outsole needs some light wiping from time to time. Length and Width. The Nike Zoom Clear Out runs long according to most users. They advise new buyers with narrow to normal-sized feet to go half a size smaller. As for wide-footers, they are advised to fit the shoe in the nearest outlet before making the purchase. Lockdown. The Nike Zoom Clear Out features an asymmetrical tongue that wraps around the foot like a burrito. 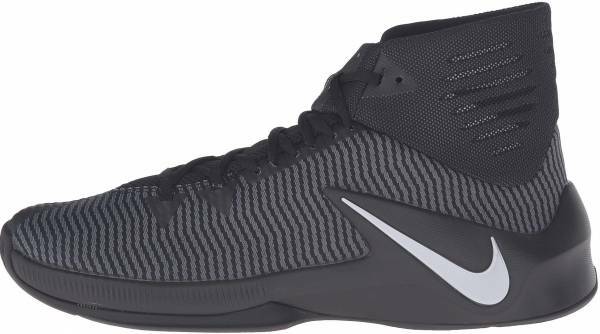 To stop the foot from slipping out of the footbed, these Nike basketball shoes boast Phylon midsole extensions that serve as heel counters. The Flywire cables that are connected to the upper also help with containment. The Nike Zoom Clear Out is made of micro-mesh. It is a tightly knit mesh that does not stretch as much as the regular mesh. Still, it is able to deliver flexibility and all-day comfort. To provide durability, fuse overlays are placed on high-wear areas. The Nike Zoom Clear Out comes in a high-top silhouette which really looks stylish on court. The Swoosh logos are located on the forefoot, lateral side, and outsole. These Nike basketball shoes look great when paired with any type of pants. Nike gave Draymond Green and DeMarcus Cousins their own Zoom Clear Out Player Exclusives, and both shoes are part of the brand’s Battle Grey pack. They come with entirely grey uppers and speckled midsoles. The shoes prominently display their respective logos on the tongue. To combat racism, Draymond Green stepped up and wore a Golden State-inspired colorway of the Nike Zoom Clear Out. The shoe boasts bold “SIDELINE RACISM” and “RISE” callouts on the lateral side and heel counter respectively. These yellow Nike basketball shoes have royal blue and gold accents. Draymond Green got his USA-inspired colorway for the 2016 Olympics where he played alongside Paul George, Kevin Durant, and Kyrie Irving. The USA colorway of the Zoom Clear Out comes with a white upper with an obsidian ankle collar, tongue, and Swoosh. It sits on a bright crimson rubber outsole.